The Bureau of Labor Statistics has been tracking the spending habits of Americans for over 100 years now. The results of their study both profoundly support the benefits of capitalism as well as show its temptations. Looking at the survey data, it is easy to see why the famous economist Keynes, believed we would be working 15 hours a week in the 21st century. He underestimated our desire for status, material possessions, and comfort. In fact, our great great grandparents would not recognize the modern budget of an average American family. What Spending Categories Changed Over 100 Years? The average American family in 1900 had one primary goal, to put food on the table. Before the era of agricultural industrialization, almost 2 of every 5 workers lived on a farm. By 1990, that figure had dropped to a few percentage points of the labor force. Union bosses, taxi drivers, and politicians seeking to maintain manufacturing jobs in America should admit that when efficiency and technology is allowed to win, costs fall dramatically and the American people are better off. Look at the chart below, and think about what you notice. 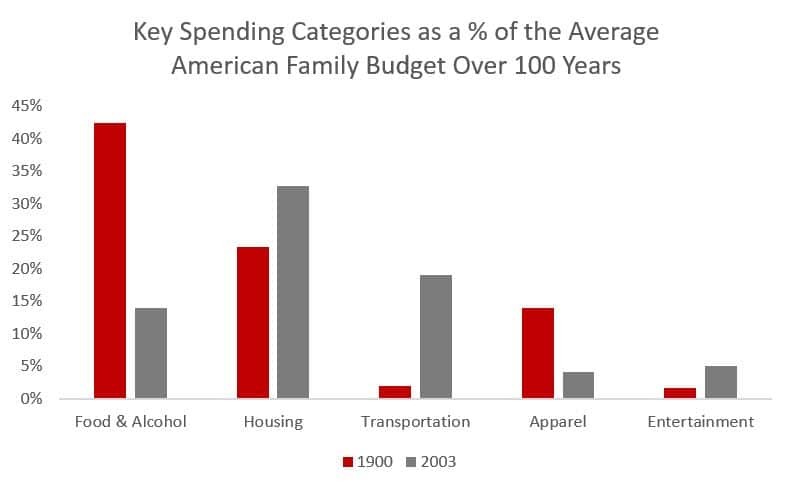 So the modern budget of 1900 saw about 42% of family earnings going to just food and alcohol. The alcohol was only 1.6% of the budget, so that bar is almost entirely food spending. Look at the tremendous drop from the red to grey bar representing the modern budget percentage going to food and booze. The insane part is that the 2003 number would be even lower if the government did not pay farm subsidies to keep more uneconomical farmers on their land. In addition, the cost to keep the family clothed went from 13% of the budget to about 3%. Sorry Donald, but NAFTA and moving clothing factories to Mexico, Bangladesh, and Pakistan has been incredible for the average American family. What do we do now that we have so much more money available to spend on clothing? We buy $3,000 wedding dresses, rent $400 tuxedos, and buy designer clothing. Our ancestors who just struggled to afford a quality outfit would have laughed at us. Essentially, the average American family gained about 25% of their budget in disposable income to do with as they chose in the past 100 years. Real wages increased dramatically as well. Where did we choose to invest this large differential that we could have used to achieve the 15 hour work week? 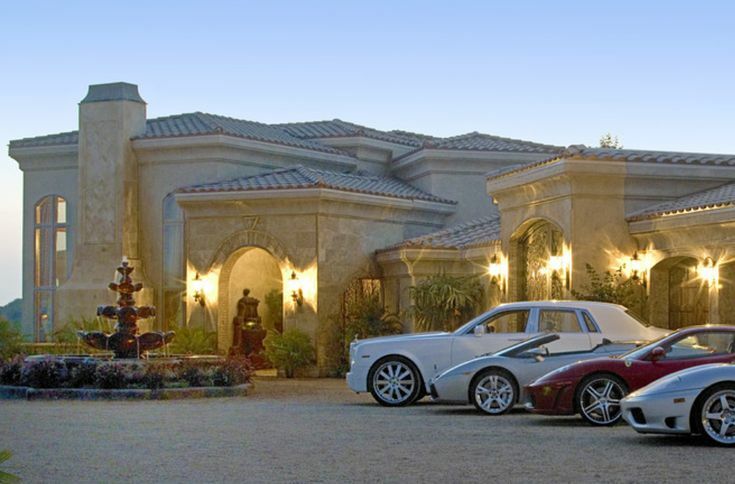 We decided to buy bigger houses and fancier cars. Notice that the spending percentage for housing went from about 23% to 34% and transportation went from about 2% to 17% over the past 100 years. If the budget of yesterday just wanted to bring home the bacon to feed the family, the modern budget is all about luxury and comfort. In 1973, the average home was 1600 square feet. Now, the average home is 2600 square feet. We did not increase the percent spent on housing to replace our bedpans with toilets and our coal fired ovens with natural gas. We increased housing spending because we wanted bigger and more beautiful castles. A similar story is true for cars. The model T was not nearly as practical and reliable as modern day vehicles, but it was cheap and accessible. How many car companies advertise boring reliability and affordability in their commercials? No, we need to buy that truck from the NFL game that drives a 20,000 pound load up a grated metal spiral with flames surrounding it. Or perhaps we need to buy a Jaguar because Loki likes it and therefore it must be otherworldly since Loki is from another dimension. We are more likely to get a paper cut on our morning commute than use the full capabilities of our Dodge Rams or Jaguar sports cars. In the debate surrounding income inequality, we hear that most Americans do not earn what they should. We should tax the rich more and give that money back to the working class and middle class families just struggling to get by. If you look at the spending data in the modern budget, it is clear that there is plenty of money available for middle class families, but they misuse it on high levels of housing and transportation spending. Instead of saving for retirement, the modern budget carves out priority space for mindless McMansion and car buying. The debate surrounding income inequality would do well to acknowledge the simple fact that most Americans spend their extra money on bigger homes and newer automobiles. Rather than tax the rich, cut off their welfare by eliminating the mortgage interest deduction. Stop farm subsidies so that the cost of food goes down even more. Eliminate vehicle inspections that force older vehicles off the road and place poor families at the mercy of repairmen who are looking for a several hundred dollar bill to fix something. Capitalism and free trade have been responsible for Americans outrageously wealthy living standards. I have traveled to many countries around the world, and this one is special. Rather than withdraw from world trade agreements because of political reasons, we should enhance them. Rather than increasing revenue, we should stop theft built into the tax code such as tax credits for Tesla, ethanol mandates, and protective tariffs for Big Sugar in South Florida. You can easily disagree with my policy prescriptions, but I want to start a conversation. If you limit your housing spending to 25% of your take home pay and your total transportation spending to no more than 10% of your take home pay while saving the rest, you will grow rich. The only reason I was able to walk away from traditional work after three years was because I did not have a mortgage or a car note. Protect yourself and spend as little as possible on the two money sinks in the modern budget, housing and transportation. Where does all your money go? Do you have different policy ideas than I do, or do you just think that the increase in housing and transportation expenses is a natural progression for a wealthier society? People who save and invest eventually become wealthy, even if they’re janitors. I remember when I wag at UCLA business school in 2008, the undergrads were protesting the minor fee hike. I think it was on the order of $500 per year. Meanwhile, I noticed most of them had an iPhone. I was in grad school, where I ended up after working several years and making several wise investments, and at the time I felt I couldn’t justify the expense of a smart phone and a data plan. Instead, that $1,000 a year savings for a couple of years helped fund a Roth account. No matter how little or how much you earn, if you can’t save at least 10% of your income, you’ll never get ahead. You can either sacrifice to get ahead, it blame other people. Previous Previous post: How Many Americans Know What Compound Interest Is?